Presenting a unique opportunity to check every box on your wish list. 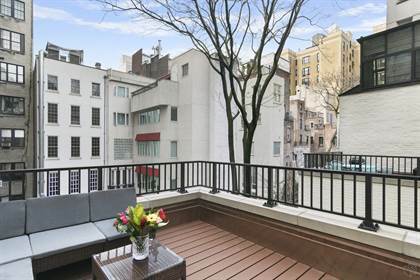 A high-end and meticulously gut renovated Upper East Side oasis in a prime location offering an expansive One Bedroom layout plus Den/Home Office and Two large south-facing private terraces. The best of pre-war and contemporary luxury living meet with two wood burning marble fireplaces, 10+ ft ceilings, herringbone oak floors, central air and washer/dryer. The bright and proportional living room is the ideal entertaining and relaxing setting with the terrace door open during the summer to hear the sound of birds chirping all day long making it feel like a country retreat and the warmth of the fireplace in the winter. The palatial and windowed eat-in chef's kitchen boasts Viking appliances, a 7-foot island to dine and entertain, a wine fridge, cleverly designed hidden walk-in pantry and massive cabinet storage. Marble bath with double vanity, Restoration Hardware cabinets and thermostatic shower fixtures. The dual private terraces off the master bedroom and living room both overlook quiet townhouse gardens and trees with electricity for year-round outdoor living. Pet-friendly boutique pre-war elevator building is located just one block away from the Metropolitan Museum of Art and Central Park and amongst world-class restaurants and shops for the perfect primary residence or pied-a-terre lifestyle. Maintain your privacy without sacrificing service with 24-hour security monitoring and staff sharing with the adjacent 970 Park Ave, where the full time super lives and packages can be accepted. Storage and additional laundry room available. Hi, I'd like to find out more information about 66 East 83rd Street. Thanks so much!